SEACOM, whose investment in a submarine fiber optic network connecting Africa to Europe and the Asia-Pacific triggered an avalanche of privately funded submarine cables in Africa, is mulling investing in the last mile. 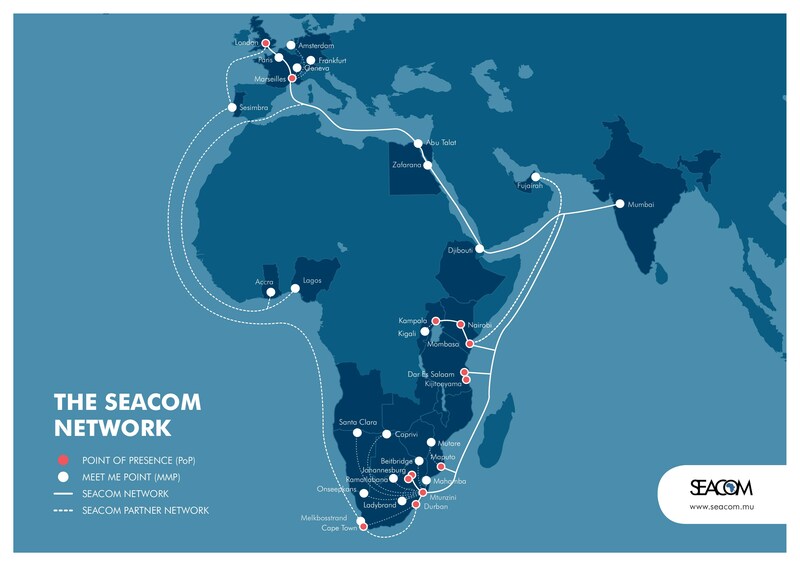 The SEACOM submarine network, with most of its landing points in East Africa, has a network design capacity of over 4Tbps and a lit capacity of only 100Gbps. Like most submarine cables serving Africa, even the lit capacity is underutilized. This is primarily because investment in access and terrestrial long-haul fiber optic networks has not marched the high capacity at sea. While Africans must be proud of the rapid growth of mobile access networks, the predominant form of broadband access, we must concede that access speeds are still too low. According to Fast Metrics, average Internet access speeds in Africa range from 0.5Mbps in Mali to 5Mbps in Rwanda. This is too low for Africans to take full advantage of lucrative cross oceanic digital opportunities that can be accessed over the submarine cables. Moreover, many countries lack adequate national backbone infrastructure to connect the mobile broadband access networks to the submarine cables. And yet access speed is the least of our problem. Transmitting very high bandwidth signals over wireless networks is a very expensive proposition. Let’s take an example of Verizon which operates both 4G LTE mobile broadband (~36Mbps tested speed) and FTTH networks in the USA. Verizon’s “unlimited” mobile plan (throttled at 22GB) cost about $80/month or ~$3/Gb per month. The cost can be as high as $18/Gb for lower monthly bandwidth commitments. But for $40/month, one can subscribe to all you eat 50/50Mbps FTTH Internet without any throttling. $70/month allows consumers to enjoy 940 Mbps download and 880 Mbps upload speeds with no limit to the bandwidth one can download or upload. The dynamics responsible for high mobile broadband data costs in America are the same in Africa and elsewhere in the world. It is going to take foresight for industry leaders in Africa to invest in wireline access infrastructure for affordable broadband access of the future. Suveer believes, as we do, that while mobile broadband has an important role to play in Africa, fiber infrastructure is not only important for connecting mobile antennas but it is a critical last mile medium for high speed applications. SEACOM is expected to push the deployment of fiber access to businesses and consumers in South Africa and other parts of the continent. As part of the initiative to reach deeper into the access, SEACOM recently launched new points of presence in Rwanda and Botswana by collaborating with local providers. We also discuss the impact of fiber optic networks in Africa during our 5-day certified optical network associate (CONA) training sessions.